This gallery is special in that it is a true co-op of artists. Each member artist shows their art in the gallery and works at the gallery a few times per month. So when you visit you can meet the artist of one of the collections and ask them about their work. So each visit to the gallery can offer a totally different experience depending on which artist is working that day. The member artists who show their work feel that the gallery is not only an extension of their studio but also it is a big part of their lives. Go to the Riverfront Art Gallery website to see a list of their 12 member artists. 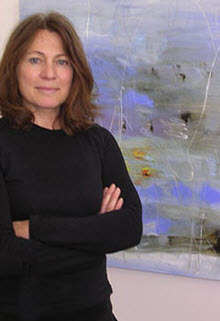 Juried showings allow for other non-member artists in the area to show their work. Each year they have two Juried showings: one focusing on photography and the other on paintings. Every few months they have special showings and events. September 13 marks their 7th year in the historic Steiger building and will be celebrating their anniversary and opening reception for the “Circle and Lines: Life Stories” by local french artist Dominique Bayart and “A Walk In The Park” photographs of local parks by Lance which includes an incredible capture of Helen Putnam Park. Their receptions are something special as they feature live music from local musicians that fill the gallery with pleasant sounds while you enjoy the art with a glass of wine. What makes Riverfront Art Gallery unique? It is truly a collection of two dimensional fine art with a few very specially selected three dimensional art pieces. When you visit the gallery you will find art without the noise or distraction of other unoriginal retail art items. This gallery is more than just a store with a bunch of paintings and photographs, it captures an artistic expression of our local culture and celebrates our surroundings and where we live. For example one young artist Craig Melville focuses on black and white photographs of the golden gate bridge which are big sellers for the gallery. His father, Dan, makes the most interesting custom made lamps that you must to see to appreciate.